A delicious and healthy Mediterranean recipe, easy, cheap and fast to make (10 min). 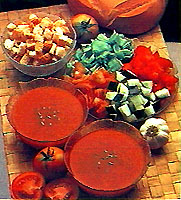 Gaspacho is a cold tomato soup, with many vegetables & garlic. and loads of various vegetables. One liter of juice for 2 to 3 guests. It is smart to put juice in the fridge long before you "make" the recipe. - Add 1/4 glass of vinegar, and half a glass of olive oil in the bottle. - Close the bottle, mix vigorously. Add some salt if juice was not salted (NaCl 7.5 g/l). Put back in the fridge. - a can of chick peas, why not ? Hot? : If you like it "hot", add more vinegar, and/or use oil where hot chilli pepper had been swimming for some weeks. In contrast, if you do not enjoy the pungent garlic smell, do not put garlic in the tomato juice: We use to keep an unspiced bottle of juice in the fridge for our guests, just in case. Too bad for them! - Nutritional density of gaspacho is very high (loads of nutrients per calory), and caloric density is low (few calories per plate): It is thus hard to eat enough Gaspacho to "put weight" and store fat. In contrast, when you eat Gaspacho, you fill your body with goodies. - Lot of vegetables, its great! Why that? Long to explain. To make a long story short, vegetables are full of vitamins, and, mor important, of protective micronutrients (phytochemicals). Micronutrient : What is it? for instance, tomato juice is red not because tomatoes are bleeding, but because they contain lycopen. Lycopen is the red color in tomato. It goes into oil when tomatoes are cooked in oil (see blog with special tomato sauce recipe, and Pizza). Lycopen is better absorbed when in oil than in tomato, from the gut to the blood. Then it accumulates in men's prostate. Edward Giovannucci (Harvard, Boston, Massachusetts) tells it prevents prostate cancer in old timers. This cancer is very frequent: almost any old man which is not dead from another cause will get a cancer in its prostate. Garlic crushing: Why is it better to wait? You should wait for a little while after crunching garlic. Why that? 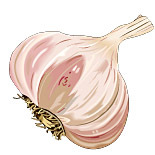 Because garlic is packed with good molecules, but they are not active inside the garlic clove. Inded the cells contain precursors of protective agents (called alliin), and the cells also contain the enzymes (alliinase) that can free the the active molecules (allicin, which gives diallyl sulfide and other compounds). When you crunch or cut garlic, precursors and enzymes are mixed, and the "good reaction" takes place while you wait. If you do not wait but cook the garlic, heat will "kill" the enzymes (60 seconds of microwave fully inactivates alliinase). If you mix or eat the garlic without crunching and waiting, the enzymes are diluted and are less efficient. Got it? Garlic, why is it good for your? Garlic would kill worms (in the gut), garlic really kills Helicobacter pylorii, a coma shaped bacteria which inhabits people stomach. Helicobacter digs holes in the stomac, holes lead to ulcers, ulcers lead to cancer (often found in poor countries, seldom in North America). More important, garlic intake seems to prevent cardio-vascular diseases, and, may be, directly some cancers. - Vitamins: loads of B and C vitamins in vegetables. A specific B vitamin is particularly useful: folic acid (vit. B9), anti-spina-bifida (so young ladies who want to "make" a baby should eat lot of folate, e.g., from spinach). folic acid also prevents heart attacks (because it reduces blood homocysteine). Folic acid is likely an anti-cancer (colon, uterus...). Tomato juice is sterile or nearly in the bottle (pasteurised). We add vinegar, which lowers pH, and put in the fridge. No bacteria can grow in this cold acidic soup. In contrast, cut vegetables waiting in their cup may mildew quire fast if they are left outside the fridge. In addition, Listeria may also grow on vegs. To conclude: spiced tomato juice, no risk. Vegs dices: keep in the fridge, and throw away after two days.